These playful yet serious and meaningful tales have been regurgitated into many forms, a lot of which people fail to recognize where they come from. Like with everything, often only the more well known stories stay with us yet there are so many that have been forgotten or missed. 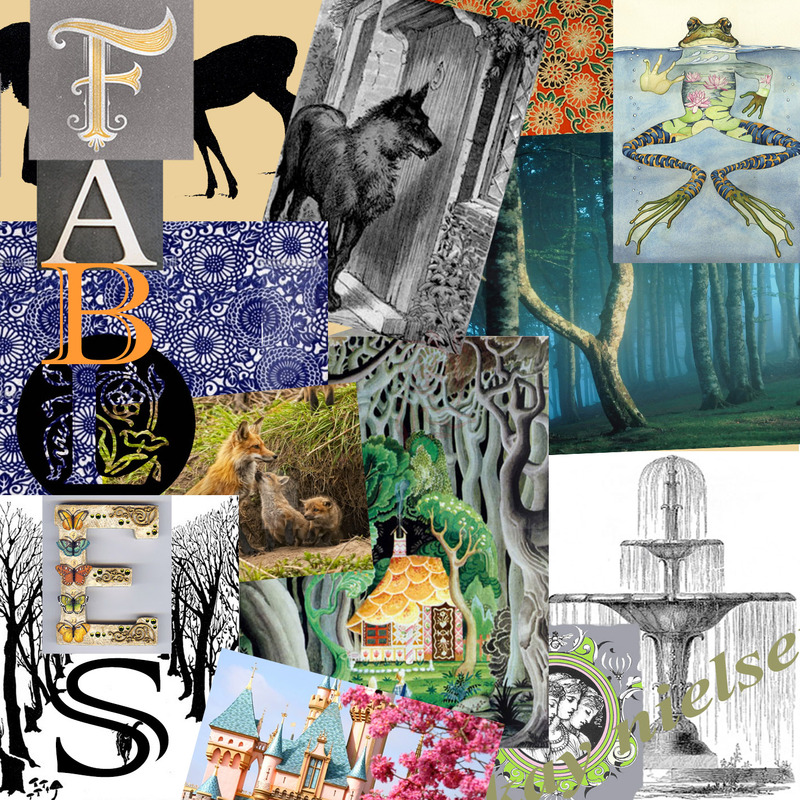 From a visual perspective what attracts me to fables are the illustrations, traditional and modern. How these narratives are pictured in a few images and the style of the illustrations themselves is what captures my interest. My designs are based on various fables that I feel I can recreate and simplify to relate to current society – as don’t forget when a lot of these stories were first published a very different audience was being read to. So far I have been focusing on the Brothers Grimm fables just because there is such a huge array tales by them, some very famous one’s and some very unknown. When I initially start thinking about design ideas I usually do an inspiration board or mood board to help focus my ideas and really get something on paper as I am the type who gets distracted easily. I particularly find my love for other people’s work gets in the way of me starting my own sketches! Mood boards are super fun and easy way to start the foundation of a design, they project where your coming from at the beginning of a concept, and they help support you at the final stages, I often come back to them when I need to refocus. I like looking at other people’s mood boards as well, they make interesting wall art. I usually do mood boards on a pin board, finding images and collating them until I have enough. This time I used photoshop, I’m a newbie with it for sure and I want to be able to use it more skillfully, this took a lot longer than usual to do, but was worth it! I used the Letter E from this talented artisan who posts her work at http://thesumofallcrafts.blogspot.co.uk/. In the bottom left corner, the black cat illustration is by Rudyard Kipling for his Just so Stories – one of the many books I grew up with and still treasure. The central image with the glowing house is by Kay Nielsen – his interpretation of the Brothers Grimm fable Hansel and Gretel. I adore Nielsen’s illustrations! I will definitely do posts that primarily focus on his works as they are so enchanting.